The Cyrus Cylinder has become a symbol of Iranian nationalism – for reasons that I already described above. Now, the object is in Tehran: a loan from the British Museum, where it normally is to be seen. This is remarkable, because in the twentieth century, the relations between Britain and Iran have gone from bad to worse, and quite recently, the Iranian Parliament discussed cutting the diplomatic ties altogether. It was no surprise that when the loan was, last year, unexpectedly postponed, the Iranians felt cheated. There was a reason for this, however: two small fragments of cuneiform texts had been discovered that contained texts similar to that of the Cylinder. Apparently, Cyrus broadcast his interpretation of the conquest of Babylonia widely. The British Museum found the study of these fragments more important than loaning the object to Iran. I do not know why, but at first sight, I get the impression that those Iranians who argued that it was a deliberate act, may have a point. If the study of so many so much more important texts can be postponed (for half a century, a substantial part of the Persepolis Fortification Tablets was ignored), it is indeed rather suspicious that finding two fragments is considered important enough to risk a diplomatic riot. Many Iranians no longer trust the British and there are wild (but unfounded) speculations that the Cylinder sent to Tehran was a replica. All this shows on the one hand how important the Cylinder has become to the Iranians, and how bad the relations between the two countries have become. Although I came to Iran to attend an engagement party in Isfahan, a visit to this exhibition, with all the political fuzz surrounding it, was irresistible. A modern Persian carpet showing Cyrus the Great, seen in Tehran. The museum has taken many security measures: visitors are not even allowed to take telephones with them. No one can say that the Iranians do not treat the object without proper care. After entering the museum, the visitors of the exhibition first arrive in a waiting room with replicas of Achaemenid art and large panels with information about the cylinder. I am aware that Persepolis is quite unrelated to Cyrus, and I am also aware that we have only Darius’ word that Cyrus belonged to the Achaemenid family (Herodotus’ evidence is probably derived from the Behistun text and can be eliminated), but the room is carefully arranged and it’s all nicely done. After a few minutes, we could leave the waiting room and enter the room devoted to the cylinder itself, which lies in a glass display, together with the two new fragments. The Iranian woman with whom I visited the exhibition, was surprised that the object was so small. After five minutes, we had to leave the room again, as if a new group of people were being allowed to enter. The system is probably designed to manage large numbers of visitors, and I have heard that there have indeed been hundreds of people every day, but when I was there, we were with only five people in the room, and no one entered when we were requested to leave. What always saddens me, is that that the Tehran museum does not sell any good books. You can get some replicas, but the visitor who really wants to know more, is left disappointed. The current exhibition would have been the perfect moment to change this, but the two small shops outside sell the usual touristy rubbish, including posters and mugs with a false translation of the Cylinder. 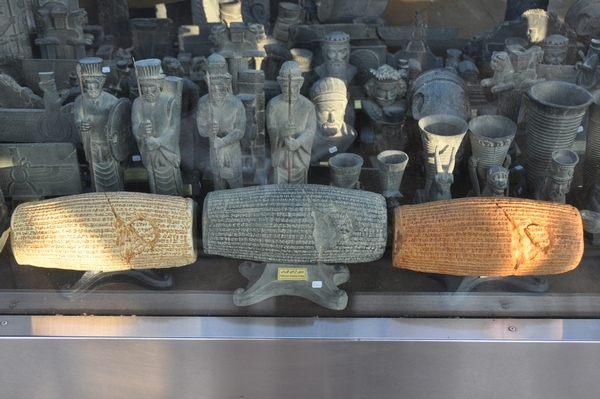 The hundreds of visitors offered the perfect opportunity to spread good, up-to-date information; why the Iranian archaeological authorities have not seized this chance, I do not know. The Nabonidus Chronicle in the British Museum. The Nabonidus Chronicle is one of the most important historiographical texts from the ancient Near East. It documents the main events of the reign of the last king of Babylonia, Nabonidus. It does so without bias: the king’s defeats are mentioned, no attempt is made to hide the fact that he did not really care for the Babylonian cult. Of course, the text was written during the reign of Nabonidus’ successor, Cyrus, but the chronicle also records how this Persian king kills citizens after a battle. So, although this text is limited in outlook, it is a valuable source. We learn that during his first regnal years, Nabonidus campaigned in the west, and then settled in Tema, an oasis in the western desert; although no explanation is offered, the consequences are repeatedly stressed: the Akitu Festival could not be celebrated. As the bottom of the tablet is missing, we do not know under which circumstances Nabonidus returned to Babylon, but on the reverse of the tablet, we find the king at home again. The tablet also describes the rise of Cyrus the Great, who is first presented as the ruler of Anšan who subdued the Median leader Astyages (550); we also learn that Cyrus conquered Urartu in 547; and we read how -in October 539- he outmaneuvered the Babylonians in a battle at Opis, which was followed by the killing of citizens. Babylon is captured, Nabonidus is taken captive, and Cyrus enters a peaceful city. The final remarks of the tablet deal with Cambyses, who appears to have made a mistake during the Akitu Festival. Relief showing Nabonidus, praying to the Moon, Sun, and Venus (Museum of Sanli Urfa, Turkey). I have put online the well-known edition by A.K. Grayson, with two important changes. In the first place, I have inserted his own “Addenda et Corrigenda”, which are too often neglected by students of his Assyrian and Babylonian Chronicles (1975, 2000). The consequences are disastrous: it is, for example, time and again stated that the Nabonidus Chronicle dates Cyrus’ conquest of Lydia to 547, which is simply untrue, and was already corrected by Grayson himself. The fact that almost nobody seems to check the additions and corrections, has allowed an erroneous chronology of Anatolia and Greece to survive for more than a generation. And I am afraid it will continue to bedevil us, because it has been accepted in Asheri e.a., A Commentary on Herodotus Books I-IV (2008), which may become the commentary on Herodotus for some time.